The story begins in 1804 when Henri Cuvelier set out to share his great passion for fine wine with his friends of the grand bourgeoisie residing in the rich and dynamic towns of the North of France, (Lille, Boulogne Sur Mer, Arras, Valenciennes...) To this aim, he created H. Cuvelier And Fils, a wine Merchant company whose rapid success continued to develop throughout the 19th century. At the beginning of the 20th century, Paul Cuvelier and his young brother Albert, anticipating the inevitable rise in « château-bottled wines » to the detriment of the « tailor-made » blends of the wine merchants, decided to purchase top quality estates in the Bordeaux area. They bought Château Le Crock in 1903, then Château Camensac in 1912 and finally the prestigious Château Léoville Poyferré in 1920. It is interesting to note that, in early 1914, Paul Cuvelier had already come to Argentina, to discover the wines of Mendoza. He found them « pleasant to drink » although not adapted to the French taste at that time. He recommended a watchful eye be kept on their development. In 1946, the family group asked Max Cuvelier to create a second Fine Wine Merchant's based in Bordeaux. It was, as it transpired, essential to have an address in the Pavé des Chartrons if one wished to be part of the Bordeaux wine world. This company has since flourished both in France and around the world. In 1998 Bertrand Cuvelier made the happy choice of personally accompanying Michel Rolland in his great Argentine project, which was to become the« Clos de Los Siete »group. Three years later, Jean-Guy Cuvelier decided to join his cousin Bertrand in the joint aim of building a Winery and producing fine wines worthy of the family tradition. The agreement between Bertrand and Jean-Guy Cuvelier was symbolically signed in the great office of their common ancestor, Henri Cuvelier, in Lille-Haubourdin, in the north of France. Since then, the Winery has been built and each year the vines of Cuvelier Los Andes have contributed 50% of their production to « Clos de Los Siete », the wine signed by Michel Rolland. The success of this wine is worldwide due to the exceptional value for money it offers. The 2003 yield has also allowed the production of the first edition of «Cuvelier Los Andes-Coleccion». Then the 2004 harvest saw the arrival of our first edition of «Cuvelier Los Andes – Grand Vin ». 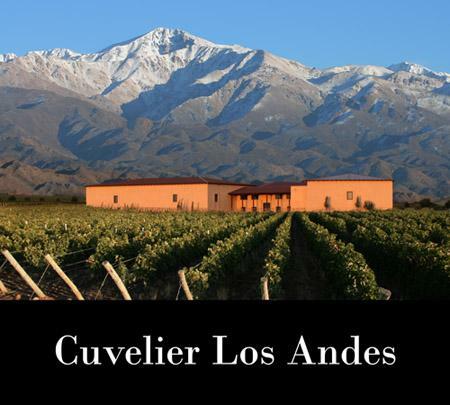 With the 2005, Cuvelier Los Andes S.A., aside from its significant contribution to «Clos de Los Siete», can now present three wines, produced with the help and advice of Michel Rolland: Coleccion – Grand Vin – Grand Malbec. The quality of these wines, produced from young wines, is well beyond our original hopes. Will the Argentine cousins rival in the future with the fine wines of Bordeaux. It is for the consumers to decide. Time will tell. We are proud to announce that the new generation has decided to join the crew, taking on the sales and marketing of the Cuvelier Los Andes S.A. wines. Wine Spectator 89"A juicy style, with fresh boysenberry, plum and raspberry flavors supported by crisp acidity and muscular tannins. Notes of tar and slate show on the dense, chewy finish. Needs some time to settle down. Best from 2015 through 2021. 5,000 cases imported."